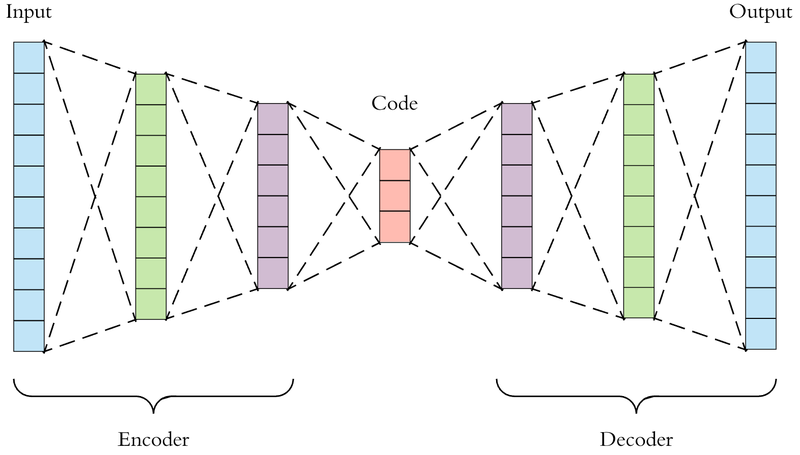 How are the layers in a encoder connected across the network for normal encoders and auto-encoders? In general, what is the difference between encoders and auto-encoders? To answer this rather succinctly, an encoder is a function mapping some input to some different space. An example of this is what the brain does. We have to process the sensory input that the environment gives us in order for it to be storable. An autoencoder's job, on the other hand, is to learn a representation(encoding). An autoencoder will have the same number of output nodes as there are inputs for the purposes of reconstructing the inputs instead of trying to predict the Y target. Autoencoders are usually used in reducing output dimensions in high dimensional data sets. The point is: how would you train such an encoder network ? """## Load the MNIST dataset"""
"""## Define the autoencoder model"""
"""## Plot the training curves"""
"""## Generate some output images given some input images. This will allow us to see the quality of the reconstruction for the current value of ```space_compressed_size```"""
"""## Plot the reconstructed images and compare them to the originals"""
I have changed the loss function of the training optimiser to "mean_squared_error" to capture the grayscale output of the images. Change the value of space_compressed_size to see how that effects the quality of the image reconstructions. Not the answer you're looking for? Browse other questions tagged machine-learning deep-learning difference autoencoders or ask your own question. What is the difference between AI and robots? What is the difference between Actor-Critic and Advantage Actor-Critic? Autoencoder why it is special for image decoding? What is the difference between IDS* and A* Algorithm? What is the main difference between additive rewards and discounted rewards? What is the difference between backpropagation and predictive coding? What is the difference between Pynq and Zynq boards for ML/DL applications? What is the difference between latent and embedding spaces? What is the difference between search and learning?